Pommes Anna was the first dish I ever cooked when I bought Julia Child’s The Joy of Cooking. I was 17 years old, still in high school. I used my black iron frying pan my grandmother had given me, it was about 50 years old at that point. It came out wonderful, I was so excited! I’ve made the same dish too many times to count since then. It remains my favorite potato dish. Though potatoes are very high on the glycemic index, this dish has lots of butter, making 69% of it’s calories come from fat, which helps the carbs be absorbed slower in to the bloodstream. Eaten with a great steak and a green leafy vegetable would make for a great meal. The magic of the recipe comes in the first two steps and in the use of a well seasoned cast iron pan. It’s an inexpensive recipe, and the active prep time is less than 15 minutes. You can certainly use a mandonline to slice the potatoes, but I’ve found it’s unnecessary. While it saves time slicing the potatoes, it increases the number of slices you have to arrange in the pan. So do yourself a favor and just make thin slices with a knife. But I don’t have a well seasoned cast iron pan? Can I still make this recipe? 1) Melt 3 tablespoons of the butter in a cast iron pan and melt the rest of the butter in a small saucepan. With the pan hot on medium heat start assembling the potato slices, beginning in the middle of the pan and overlapping each slice, like the scales on a fish. You want them to be in a swirl pattern, this is what is going to show when you serve the dish. 2) Drizzle the layer of potatoes with a little butter, and add another layer. Sprinkle with sea salt and pepper. 3) Repeat the butter, potato, and sea salt layers until you’re out of potatoes. 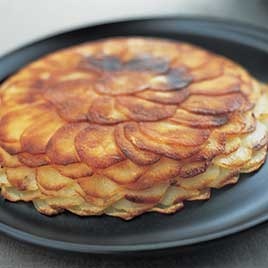 4) Place a cake pan on top of the potatoes, press down firmly to compress the cake. Place a heavy pan on top, set timer for 30 minutes, allowing potato cake to brown well on bottom. 5) Slide the pan into the oven, leaving the cake pan and heavy pan on top and bake at 450 for 20 minutes. 6) Remove the pans on top and bake for another 20 minutes to allow the top to brown. 7) Invert the pan on to a cookie sheet or serving plate and allow to rest a few minutes, slice and serve.